Stratford, Ont. Canada. Empty Bowls Fine Art Auction, House of Blessing. An Shan City, Liao Ning Province, China, ICCPS from Tokyo, Japan. 2017 Paris, France, Carrousel du Louvre, SNBA, Société Nationale des Beaux-Arts,7-10 Dec.
7th International Chinese Calligraphy and Ink Painting Artists Society Exhibition. Stratford, Ont. Canada, Stratford Garden Festival. Stratford, Ont. Canada, Expressions in Wood. 6th International Chinese Calligraphy and Ink Painting Artists Society Exhibition. Marly-Le-Roi, Les Rencontres de l'Atelier, France. Avec Carole de Montigny et Alain Bonnefoit. London, Ontario, CherryHill Library, CCPA, CCAC. 5th International Chinese Calligraphy and Ink Painting Artists Society Exhibition. 4th International Chinese Calligraphy and Ink Painting Artists Society Exhibition. Liao Ning Province, China, ICCPS, Special Award. Han-Shan Province, China, ICCPS International Exhibition. Stratford, Ont. Canada. Gallery 96, GODDESS, The Art of She within We. Foreword R. Aziz, Ph.d, Design K. Griffiths-Fulton, Photography J. Lederman & D. Charlesworth, Pandora Press, Kitchener, Ontario, Canada. 1993 Waterloo, Ontario,“Bending the Bows” Kitchener Waterloo Symphony Orch. 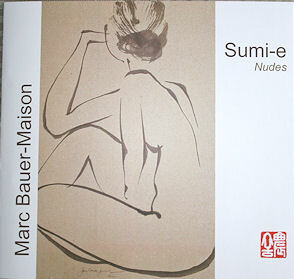 Marc Bauer-Maison is a member of the North American Branch of ICCPS, International Chinese Calligraphy and Ink Painting Artists Society (ICCPS). The head office is located in Tokyo, Japan, under the leadership of Ransui Yakata.